Protect your skin with a hydrating sunscreen. Hawaiian Tropic is known for a delicious tropical scent in their sunscreens. This new product is less greasy than the original, and is perfect to use as an everyday moisturizer with sun protection. Upgrade the SPF in your makeup with a tinted face moisturizer. It provides skin perfecting coverage as well as SPF 30, which is higher than most cosmetic sunscreens. I love that Josie Maran makes all of her products with Argan oil, one of the best natural moisturizing ingredients. Don’t forget about your lips! Lip products often don’t have a high SPF, yet our lips have the thinnest skin on our body. Supergoop’s lip balms smell incredible and are super moisturizing, perfect for a day at the beach. Your hair can fall victim to sun damage as well. 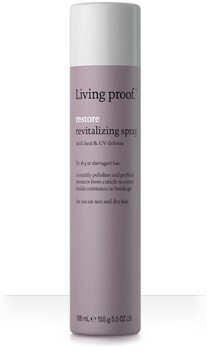 The latest line to come from Living Proof’s labs helps repair dry and damaged hair while keeping it looking smooth and gorgeous. This conditioning spray protects from heat and the sun’s rays, too! Tip: use spray on hair after a swim. Prevent nail polish from fading or yellowing in the sun with this top coat. No more dull summer pedicures! Disclosure: Compensation was provided by Hawaiian Tropic® Sun Care via Glam Media. The opinions expressed herein are those of the author and are not indicative of the opinions or positions of Hawaiian Tropic. Hawaiian Tropic is a trademark of Tanning Research Laboratories, LLC. 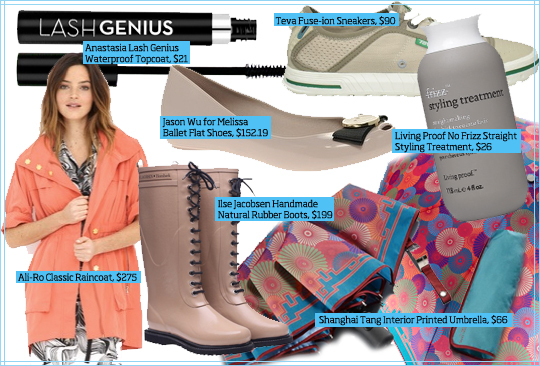 You can now also check out the Glam.com “Things We Love” hub sponsored by Hawaiian Tropic! Few things can put a damper on your style like a rainy day. How are you supposed to look cute when you have to stay dry? We’ve found some chic wardrobe additions to protect you from any April showers that may come your way, plus the products to keep your hair smooth and face flawless. Bring it on, mother nature! Shanghai Tang makes amazing umbrellas that are as beautiful as they are functional. Compact enough to fit in your purse, these umbrellas are printed on the inside as well so you can enjoy their phenomenal patterns while staying dry. It seems the only option for footwear in the rain is a pair of knee-high boots, but if you’re looking for something more comfortable and lightweight that will still keep your feet dry, Teva’s Fuse-ion sneakers are the perfect solution. Brighten up a rainy day with one of Ali Ro’s colorful classic raincoats. The flattering silhouette is chic to wear on a sunny day too! Melissa makes a line of plastic shoes that are stylish enough to wear any time. One of Melissa’s designer collaborations, Jason Wu created these adorable ballet flats. These are fab for days when you still have to look dressed up when the weather’s less than ideal. These gorgeous rubber boots are handmade in Denmark. They come in amazing colors and we just love the lace-up detail. Durable and fashionable. Anastasia might be a brow expert but she definitely got it right with this new lash product. Waterproof your favorite mascara by layering on this topcoat and never have runny raccoon eyes ever again. If you think a rainy day means your blowout is out of the question, think again. Living Proof makes incredibly effective styling products like this No Frizz Straight Styling Treatment that keep you looking sleek and smooth in any climate.